With transmission at operating temperature, check the fluid level to make sure the fluid volume does not exceed the manufacturer’s recommendation. Add one pint (16 oz.) of TRANS TUNE to the transmission filler. When adding before a fluid change, drive at least 30 miles to circulate and clean before replacing fluid. When used as a cleaner or conditioner, add TRANS TUNE for the life of the fluid interval. Compatible with all fluid flushing machines. TRANS TUNE will help restore shift quality by cleaning sticky varnish from valve bodies and shift solenoids. TRANS TUNE is compatible with all conventional and synthetic petroleum and mineral-based automatic transmission fluids. TRANS TUNE only contains petroleum-based ingredients and will NOT harm your fluid systems. Help your transmission shift smoother and last longer! 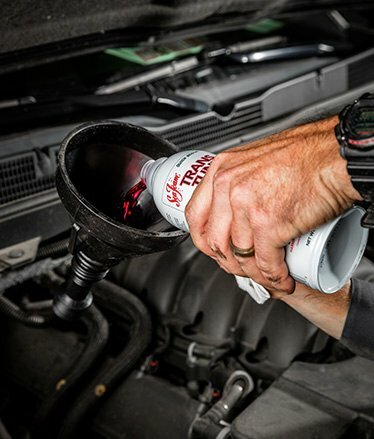 For cars & trucks with transmission problems – try a can of Trans Tune! Most automatic transmission shifting problems are caused by sticky varnish residues that form in old fluid. Sea Foam’s Trans Tune works fast to reliquefy varnish deposits from valve bodies, solenoids and shift actuators. Before you spend $$$$ on a new transmission, try adding a can of Trans Tune to your fluid filler – super easy! Also works great as a fluid cleaner and conditioner, or as a pre-flush cleaner. Find it wherever automotive products are sold.